There are three ways how to output music on X68000 - Built-in sound, Roland LA sound source, Roland GS sound source. 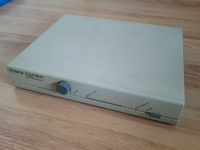 The Roland MT-32 MIDI synthesizer module, which was accepted as the industry standard for X68000, was introduced in 1987, the same year when the first X68000 came out. It used Linear Arithmetic synthesis to produce sound and saw several upgrades. 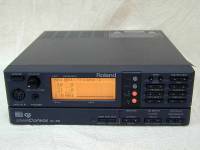 The Roland SC-55 General Standard module, which was introduced in 1991, supported LA through emulation which was not accurate and thus noticeably degraded music quality. However, there are some games that take advantage of GS enhanced capabilities. *Linear Arithmetic synthesis available through emulation. 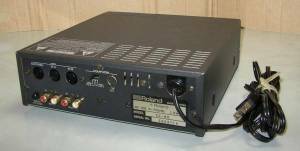 The MT-32 was released in 1987 by Roland. It established an early de facto standard in computer music and was the first product in Roland's ミュージくん (myūjikun) line of Desktop Music System (DTM) packages in Japan. The original MT-32 comes with a preset library of 128 synth and 30 rhythm sounds, playable on 8 melodic channels and one rhythm channel. It also features a digital reverberation effect. Successors (see below) added a library of 33 sound effects. Because of the absence of a piano attack sample, it cannot play a convincing acoustic piano sound. Released in 1989, this Roland CM has only a volume knob, a MIDI message and a power-on indicator as external controls. CM modules are compatible with MT-32, but feature 33 additional sound effect samples which many games took advantage of. These sound effects cannot be heard on a MT-32. Control CPU is an Intel P8098 and DAC is a Burr-Brown PCM54. A combination of the CM-32L with the sample-based CM-32P, features a Memory card slot for ROM cards with PCM data. The CM-32P part plays on MIDI channels 11-16 which are not used by the CM-32L part. There were a total of 15 PCM ROM cards and Gemini Wing takes advantage of SN-U110-07 and SN-U110-10. 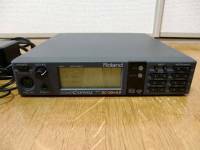 The Roland SC-55 (Sound Canvas) is a GS MIDI sound module released in 1991 by Roland. The SC-55 was the first sound module to incorporate the new General MIDI standard. The SC-55 used both PCM and a cut-down version of the LA synthesis engine, to support 24-voice polyphony with 16-part multitimbrality. It came preloaded with the Roland MT-32's variation bank, but lacked the MT-32's re-programmability. Aimed at PC music enthusiasts, the SC-55 featured 317 instrument patches, including the GS drum kits and additional controllers. The selection of effects includes reverb and chorus. Since the SC-55 has no programmable memory, CM-32P and MT-32 emulation is done by providing the same sound arrangement as the preset sounds of actual devices. These variation banks are enabled by playing back special SysEx containing MIDI files, for example GS32.MID (included in the SCC-1 Utility Software), prior to loading a software title. These specially arranged tone tables contain the relevant GS sound mapped at either CM-32P or MT-32 program number. Pitch bend range is changed to 12 semitone from GS default 2 semitones. Master tuning and modulation depth are not altered by the emulation. Pan directions are reversed from actual CM-32P or MT-32 devices. CM-32P or MT-32 specific MIDI SysEx messages are also ignored by the SC-55. The Roland SC-55's CM-32P and MT-32 emulation is based on using preset sounds of the actual devices without utilizing programmable memory or actual device synthesis techniques. This results in poor emulation for software titles relying on custom programmable MT-32 sounds. Software titles supporting the Roland MT-32 but not utilizing its memory are emulated with better results. A minor upgrade to the original SC-55. The Mk2 model has an upgraded ROM, that has a few more instrument sets that are not in the original SC-55 and brings the total number of notes it can play at once to 28 (over the 24 of the first one). It also has an RS232 port that the first one does not have, allowing computers that only have a serial port to communicate with it over RS232 using special MIDI drivers or software that support MIDI through a serial port. The DAC in the Mk2 models was also upgraded to an 18 bit one, over the 16 bit one of the original. Roland SC-88 features twice as much voices, tones and drumsets as its predecessor the SC-55mkII and has an 18 bit DAC as-well.